My Traveling ABCs Discounts Apply ! 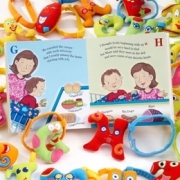 My Traveling ABCs includes Shopping with My ABCs board book and 26 plush letters featuring adorable facial expression, rich fabric textures and a colorful strap. Attach letters on the toy loops on your Clean Shopper or other shopping cart cover to entertain baby, or use as a chance to practice ABCs, sounds, and letters with older children.